The Tifosi Dolomites 2.0 are a strongly performing pair of glasses that allow for a good level of ventilation around the nose and ears, without being too breezy. I found that the lenses were both easy to fit and secure in the sturdy frame. They were however let down by the level of misting I experienced when the temperature started to rise about 15 degrees, especially when this was an issue that was meant to have been fixed from the previous model. The strongest aspect of these glasses is the fit, which gives just enough pressure on the side of your head to negate the effects of rubbing on the top of the ears and nose. I find that with many glasses in this price range, that despite getting much of the basics right, small aspects like the way they sit after a few hours in the saddle are the things that could be done better. This has clearly been thought through with these glasses as throughout the test period, they were never uncomfortable or irritating. Part of this comfort comes from a good level of ventilation around the nose and ears, helped by the two vents on the outside of the lenses. It means that air can get to where it can have the most affect in keeping these areas cool and sweat free. The lenses themselves are also very effective in terms of protection; very clear and scratch resistant. There are three that come with the glasses, one set for regular sunshine, one clear and the other with a slightly orange tint. 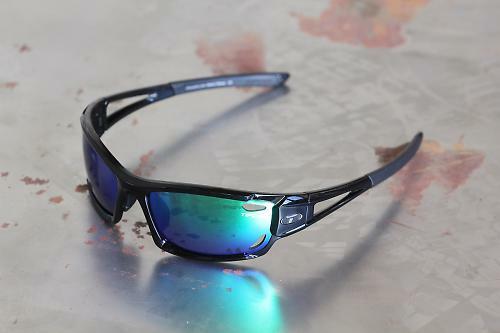 The sun lens works well, with 10.3% transmission effectively stopping glare while allowing you to see clearly. The orange 41.4% transmission lenses work well for almost all conditions, even in low light. The clear lenses are also effective during dark or overcast rides. There was a very slight warping, but nothing too major. That being said, the one and only downside of the Tifoso Dolomites is that you need to turn your head slightly further than with traditional wraparound designs like the Oakley Radar Path. This is due to the frame completely wrapping the lenses. To be honest, this is a small price to pay, as I believe (and Geraint Thomas' recent choice in the peloton show) that this shape of glasses look much better. With the Oakley Racing jackets for instance, the sides of the frame sit further back, meaning that you do not have to look round as far to shoulder check. Each set of lenses are easily interchangeable by simply popping them through using your thumbs after slightly expanding the edge of the frame. In other glasses this would seem slightly off-putting, simply because you would not expect to have frames with enough strength to withstand this pressure. However, The Dolomites are sturdy and this was not an issue at all. In fact the build quality of the glasses is strong throughout. The hinges are pleasingly stiff without being awkward, the rubberised arms seem secure and the whole frame appears to be well made. However, despite their many good points, the Dolomites have one large flaw - well they did for me, namely their tendency to mist on climbs in warmer weather. My first couple of weeks of testing of testing them was in 6-10 degree early spring weather on flat terrain. During this time I hardly had any issues with misting, even when using them in the wet. That changed when tempretures started nudging up in the last two weeks of the test period when it reached 15 degrees and I was doing some big climbing routes. Misting became a real issue on the climbs. When on high gradient climbs I found this to be particularly bad as the venting simply did not suffice when going under 15km/h up a hill when you are pumping your legs and getting hot. Half way up one particular hill it became so bad that I couldn't see out of the glasses. On long climbs when you can't get speed up to force air through the vents, this becomes a big problem especially if you don't want to stop half way up to take them off. When fogging occurs on the flat if you have stopped, it is quickly cleared thanks to the decent ventilation through the lens vents, but when climbing, this is not the case. It is worth noting, that on the flat, there were only a few times when misting occurred at this temperature, and the issues I had were purely on longer climbs when riding at lower speeds - below 12mph. I have also used glasses that fog worse than these, but this latest version of the Dolomites has more ventiliation than the one it replaced so it was a disappointment that this aspect of their performance could not match the quality of the rest of the glasses. At £70 the Dolomites aren't that expensive when you compare them to others that you see in the peloton. If you went for a pair of Oakley Valves or Turbines (which are roughly the same shape) they would set you back £120 or £150 respectively. Having owned a number of more expensive glasses I would say the differences are not in the construction, but in the R&D for things like ventilation on climbs to prevent the misting that these had at high intensity but low speeds. To some extent of course glasses are like helmets, saddles, shoes, and even shorts - how well they fit you is going to depend as much on how the relevant bit of your anatomy fits them as their shape fits you. So just becaue I had a problem with the Dolomites doesn't necessarily mean you will too. For me the shape of my nose (I've got a flat bit on the side where I broke it a few years ago) means I wear my glasses close to my face but that doesn't make my Oakley's fog up to anything like the degree the Dolomites do. 'What about moving them forward?' I hear you ask. 'Easier said than done' I'd reply - this problem only really occures when the pips are squeaking as you focus all your efforts on maintaining forward momentum on a long or steep climb - that's not the time you want to start having to fiddle with your glasses. At 26g Dolomites are likely to find favour with the weight weenies of the world. This relatively lightweight makeup may help decrease the rubbing on both ears and nose and allow them to stay in place well. When they are not on your face, they come with a well designed hard case that has a clever lens storage area that keeps the lenses in separate pockets. It also has a glasses bag that doubles as a lens cleaner, which I had no issues with when cleaning the lenses. They fit well into helmet vents for when you want to have your glasses easily accessible, but don't want them in your jersey pocket. Overall, I was very impressed with the Dolomites until the misting problems arose when climbing. It is a shame that this was the case, because aside the slight issue with shoulder checking, these are good glasses. However, not being able to see out of them because they've misted up on a climb is not something you can ignore. At £70 they are pretty good value and if you aren't in an area where you are doing lots of hard climbs or they work with the shape of your face they are worth considering. For use either in the peloton or just on the roads. They protect against dirt, dust and sunlight. The glasses work really well for eye protection against dust, dirt and the sun. They excelled in practically every area you would want in a pair of glasses. Adjustable temples and nose pieces for custom fit. Very well made, sturdy whilst also managing to minimise weight and add in non-slip features and vents. Lenses worked well for protection and venting at high speed on the flat. However, when climbing higher gradient hills at slower speeds these had some fairly large problems with fogging. They are glasses, so naturally if you were to run them over they would probably break, but they certainly feel durable and well made, the kind of glasses that you would probably wear for a few years. At 26g (the Road.cc scales of truth shaved 3g off Tifosi's own claimed weight) they are impressively light for full frames with anti-slip materials. Great ventilation for keeping the tops of your ears and bridge of your nose dry and cool. Light weight construction means that they are easy to wear for hours without even noticing them. £70 seems about right. Well made and comfortable, but the reason you pay big bucks for the best cycling glasses is so that you don't have things like the fogging issues on climbs. Very well until you hit a steep slower climb. Use on my commute was fantastic, but on a club run with steeper hills and higher temperatures, the fogging issue became clear. The ventilation to keep your nose/ears cool and weight are fantastic. It meant that I could quite easily forget I was wearing them. The fogging on steep climbs. Did you enjoy using the product? Yes, on the flat; no, on climbs. Would you consider buying the product? If I lived in a flat area. Would you recommend the product to a friend? If they lived in a flat area. A good set of glasses if you are riding on the flat and not looking to do hot alpine climbs.